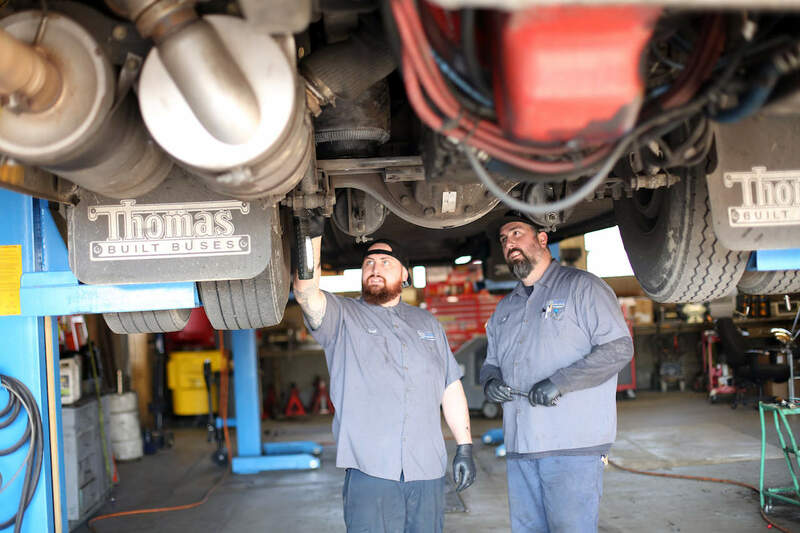 The increasing complexity of transportation has made the automotive technician one of the most technically demanding occupations, as well as one of the most injury prone. Not only do modern school bus mechanics have to continually learn new technology, they have to constantly practice safety, for the benefit of students and themselves. And that means staying out of harm’s way. 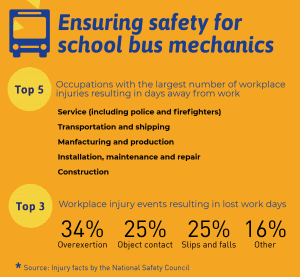 The National Safety Council reports that both transportation and repair-maintenance workers are ranked among the top five occupations that have the largest number of workplace injuries that result in lost work days. In most cases, employers lose workers to the three most common types of injury events: Overexertion, harmful contact with equipment and falls. With all workplace injuries estimated annually at 4.5 million in the U.S., workplace deaths are comparatively low, at 5,000 annually, according to the NSC. Fatalities also do occur within school transportation, even in the safest districts. The Pulaski County Special School District in Arkansas is recognized in its community for top bus safety and security protocols. School bus inspections are conducted four times a day. Yet the district reported the death of a veteran mechanic who was hit and killed by the bus that he had pulled over to close a lift gate door that had swung open. When the mechanic closed that door, the air brake disengaged, and the bus began rolling in neutral. It was the first school bus accident that resulted in a fatality for the district. The best defense against workplace incidents is a good offense. 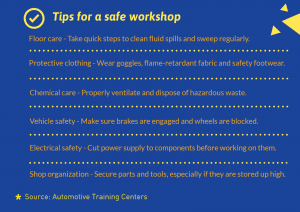 Governments and vehicle manufacturers have heavily invested into safety education and technology training programs to keep employees safe. Through a new “Work to Zero” initiative, the NSC aims to educate employers about new technological safety advancements, to reduce and ultimately eliminate preventable deaths in the workplace. A $500,000 grant from the Pittsburgh-based McElhattan Foundation promises to help NSC develop tools and resources for employers who want to integrate potentially life-saving technology and comprehensive reports. “Technology holds immense promise when it comes to mitigating human error. We are seeing this on our roadways, as our vehicles become more automated, and we can see it in our workplaces, too,” said Deborah Hersman, who last month concluded her tenure as NSC chief executive officer and president. School Transportation News was curious to know what school bus mechanics want and need to do their jobs better and safer. STN sent out a survey last year that asked about the most-requested training within districts. The top request was diesel emissions system training at 44 percent of the total responses, followed by electrical systems at nearly 25 percent, and then a big fall-off at 10 percent for preventive maintenance. Training requests for alternative fuel systems came in at 7 percent, trailed by other issues that ranged from phantom engine fault codes to rust mitigation. Professional development is helping mechanics expand their knowledge amid an era of changing technologies on school buses. Each fuel type has its own independent requirements. With the expansion of propane and emergence of multiple electric battery-powered vehicles, school bus operators are seeking resources to help mechanics/technicians handle different fuels in the shop. For example, the school transportation team at the Huntington Beach Union High School District in Southern California has proactively added new vehicle technologies to its fleet. The district started 2019 on a high point, with the delivery of 15 new Thomas Built CNG buses, which was made possible through a grant from the South Coast Air Quality Management District (SCAQMD). With the introduction of more alternative fuel-powered and electric buses, school bus manufacturers and suppliers are increasingly focused on technology convenience and the high number of usable parts across all fuel types. Organizations such as the Propane Education and Research Council (PERC), stand ready with training programs and assistance to set up infrastructure for customers venturing into new technologies. All major OEMs also offer specialized training at their main factories, as well as at industry conferences—and even virtually. IC Bus partners with its dealers to offer traditional training, as well as online courses, to its customers. The manufacturer sponsors multiple sessions of IC Bus University, a popular training program that is now in its 11th year. For the program, IC Bus customers travel to the Tulsa Bus Plant in Oklahoma for four-day sessions that are instructed by the people who design and build the vehicles. This year, for the first time, IC Bus is offering an advanced program for technicians who have previously attended IC Bus University, but who are looking for more in-depth training. “Alternative fuel-powered vehicles are often easier and most often less complicated than today’s diesel-powered products,” said Alan Stegich, regional service manager for IC Bus. Last year, Blue Bird Corporation provided high-standard training to nearly 800 technicians through the New Blue Bird Academy. This year, the bus manufacturer is offering customers (mostly technicians) factory-based, hands-on training at its facility in Fort Valley, Georgia, in partnership with suppliers, including ROUSH CleanTech, and at the STN EXPO Reno. Factory training events and onsite training are used to provide technicians with the knowledge and skills that are necessary to safely work with and around diesel alternatives. “Blue Bird equips technicians who work on Blue Bird buses, with the confidence to work with any of our fuel options. We use all of the available resources, in order to train technicians on how to handle and work with alternate fuel options,” said Glen Braly, technical training manager at Blue Bird. Later this year, the company will launch a new three-tiered technician certification program through its Blue Bird Academy for anyone who wants to learn about its products. This first tier, called Associate Level, is web-based and open to all industry professionals, whether they work on Blue Bird buses or not. Advanced Level, the second tier to be released in 2020, will offer a blended approach of factory-based training with companion online courses. Third, the Master Level will become available to those who have successfully completed the first two tiers and want to be considered experts, with the ability to train others back in their shop. Meanwhile, the Thomas Built Institute is scheduled for May in Greensboro, North Carolina, and July in Reno, Nevada. School bus operators are in direct competition with other automotive, diesel and collision industries to attract and retain technicians, who are increasingly in short supply. The TechForce Foundation in December released updates to its technician supply and demand reports, which foresee a worsening shortage of transportation technicians in 2019. As demand for technicians continues to rise, the potential supply that is graduating from colleges continues to decrease. There are other sources of supply for technicians than postsecondary institutions, such as vocational schools and hands-on experience. But the continuing increase in demand for technicians, and the general decline in technician college graduates, are only aggravating the existing shortage of trained technicians. “Training of new entry-level technicians in alternative fuels is critically important, as we start to see more of these vehicles across all transportation industry segments,” said Greg Settle, national initiatives director for the TechForce Foundation, a nonprofit organization that supports professionals and students in technician careers. TechForce Foundation is funded in part by automotive industry companies and educational institutions, such as the NASCAR Technical Institute and Universal Technical Institute. It offers student scholarships for vehicle technician training and recruitment resources. In fact, more than $2.0 million in scholarships and grants are awarded each year.